The orchestra is about to begin their evening concert. You can hear the sounds of the instruments from behind the curtain as the musicians fine tune their instruments as they get ready to perform. Your eyes are drawn to the curtain going up to reveal the orchestra. But wait, instead of violins, flutes, clarinets, trumpets, and other instruments you'd think to see in a performing orchestra, you see the musicians holding a medley of... vegetables! Carrots,cabbage, celery, cucumbers, leeks, radishes, peppers,sweet potatoes and more are being held by the musicians. Yum, the room smells good enough to eat as the odors of the vegetables waft through the room! This is a very unique orchestra, it's name... the Vienna Vegetable Orchestra. The eleven members of the Vienna Vegetable Orchestra began in 1998. Based in Vienna, Austria, the orchestra has performed concerts in Europe and Asia. They also performed at Lincoln Center Out of Doors in 2005. It's obvious that this unique group of musicians didn't listen to their parents warning them about not playing with their food! The members of the Vienna Vegetable Orchestra have found just the opposite. Playing with vegetables can create beautiful music! Before every concert the members of the orchestra have to get their "instruments". To do so, they visit local produce markets searching for the very freshest vegetables to make into their evening's instruments. About 90 pounds of vegetables go into a performance. After making their selections, the members of the orchestra cart the vegetables to the place they will be performing. The next step takes about an hour. Using drills, knives and other kitchen utensils such as a peeler, the musicians transform the vegetables into musical instruments. Cutting, carving and drilling, all musicians are focused on creating their instruments for the evening performance. 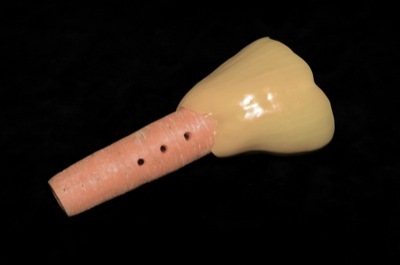 Drills are used to hollow out carrots turning them into carrot recorders. Radishes are turned into flutes or marimbas and pumpkins into bongos. Need a saxophone, cucumberphones are made. Need a violin sound?Leek violins will do the trick. Eggplants are used as cymbals and red and yellow peppers can make a great trumpet sound. Some vegetables don't need any preparation. Onion skins will be used in the performance, pulling the layers away or rubbing the skins together to make a crunchy sound. Cabbages are also pulled apart or rubbed together to make musical sounds. The Vegetable Orchestra performs about 20-30 concerts per year. During the performance, the sounds of the vegetable instruments will change as they dry out from the stage lights. Others will become mushy and need to be replaced. Good thing extra vegetables are purchased! As to the music, just what do vegetable sounds make?Just like in an orchestra composed of woodwinds, strings, brass and percussion, the different vegetables create similar sounds.Classic, jazz, pop music is all created with the vegetables. One big difference with the Vegetable Orchestra is that often at the end of their performance, vegetable stains dot the musicians'clothing! After the Vegetable Orchestra has completed their music for the evening, soup is often made from some of the vegetables and shared with the audience. Remaining vegetables instruments are also given to the audience and part of the remains of other vegetable instruments will head to local organic composting areas. The musicians of the Vegetable Orchestra say that they like to bring the hidden sound found inside the different vegetables to the surface. With an adult you might like to make a carrot kazoo. You will need a thick carrot , an electric drill and some wax paper. 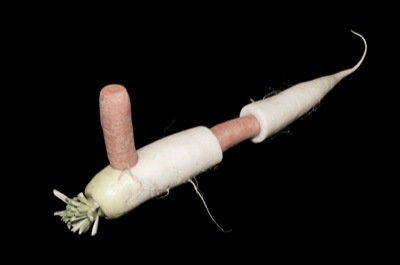 Cut a carrot top off so you can use the drill to make a hollow hole inside the carrot. Cut a large hole on the side of the carrot. Take some wax paper. Blow through the hole to make the music with your carrot kazoo!